This is a sophisticated way to turn off/ hide WhatsApp message on iPhone lock screen as a preview or instant read. In the latest iOS devices have an option for manage notification for an individual app we can handle easily cause it has been constructed customize full and user-friendly. 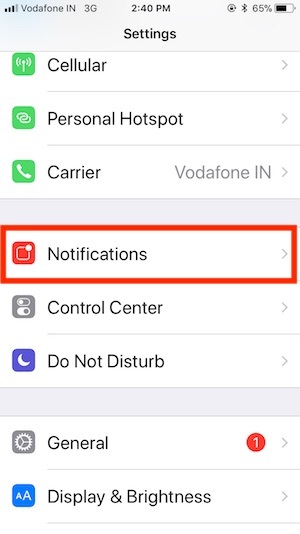 If we are talking about app Notifications for iPhone, iPad, and iPod Touch devices, then everything about notification you can keep as you like Such as Notification sound, badge App icon, Show Notification on the lock screen and Notification Alert Style when iPhone Unlocked (None, Banners, alerts), etc. Kindly, this point should be noted: if you have done turn off WhatsApp message on iPhone lock screen. Then you can’t access next coming WhatsApp message notification from the Control center on the lock screen or Coversheet. Even if you agree with this above-given condition, then the follow at below outlined a way for to hide WhatsApp message on iPhone lock screen? 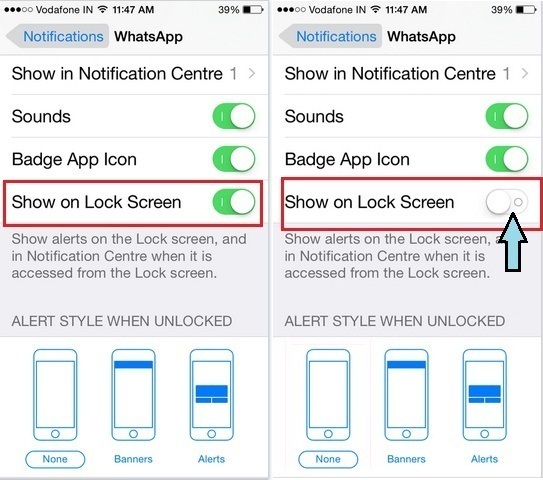 So really want to make disable or stop next coming WhatsApp message on the lock screen of your iOS devices then get started following six steps. And your notes will become unreadable from locked screen iPhone and overcome your worry about secret WhatsApp Chat message replay notification. #1: Go to the Settings app on iPhone, iPad. 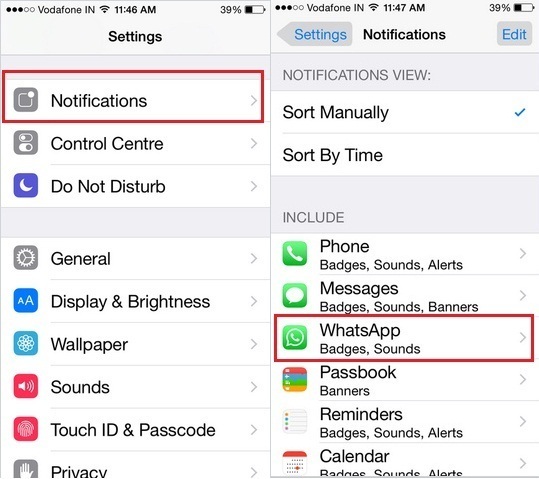 #2: Tap on Notifications under settings. #3: Here, See the list of app that we can customize notification alert and view or disable it entirely. 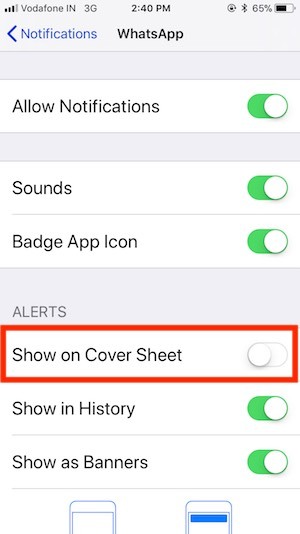 Disable Show on Cover Sheet. 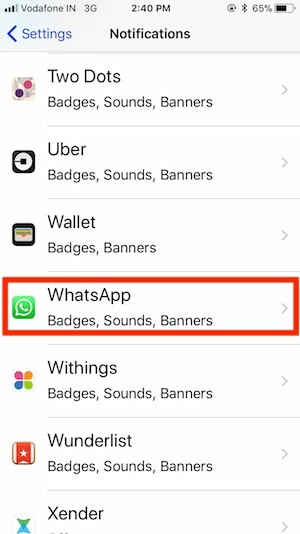 If you are disabling WhatsApp alerts on lock screen because of notification sound, keep turn on it and disable sound for WhatsApp only. Same like WhatsApp we can do for other social or messaging app installed on the iPhone or iPad. Find WhatsApp in the list, Tap on it. Step 6. Leave everything as it is likely badge app icon, Sounds, etc. That’s it. So now nobody can see your next arriving WhatsApp messages on your locked Screen iPhone notifications bar. But yeah you can be getting WhatsApp message notification after unlocking iPhone screen. This same way you can also follow on Facebook and Facebook Messenger for iPhone and iPad. And you can make your often locked screen iPhone alerts and Notification pop up as Silent. Let now tell us how you feel after making unseen/ hide WhatsApp message on iPhone lock screen. Hope you’d like this way and you’ll stay coupled with our site to getting more tip for iPhone XS max, XS, XR, X, iPhone 8 (Plus), iPhone 7, iPhone 7 Plus, iPhone 6, 6 Plus, iPhone SE, 5S, and Mac OS how to tips.